Considering selling your house and want to do it as quickly as possible? Of course! Most people want that. We buy and sell houses all the time and have some proven tips on how to sell a house fast in Memphis… or any other town or city. We use these tips every time we sell a house we’ve fixed up. Most were learned when the real estate market tanked back around 2008. With foreclosures up 81% back then, there were a lot of houses on the market clamoring for the attention of the reduced amount of buyers looking to buy a home. We were forced to find ways to compete and get houses sold. In this article we are passing those hard-earned lessons on to you so that you can better be able to sell your house fast in Memphis or anywhere. We quickly noticed that the single biggest factor in getting a house to sell fast in any market is the price. Yes, how much you are asking for your home plays a huge role in being able to get offers right out of the gate. Consider this from the point of view of buyers looking to buy a house in your neighborhood or area. They are likely going through dozens or even hundreds of listings that are most likely sorted by price. Everybody wants a bargain. They are judging your house and its price against what your neighbors are asking for a similar house. Find out what other similar houses are selling for and how fast they are selling. Take the closest matches that sold quickly and average the selling prices. If you are working with an agent, you can have them show you pictures of the houses that sold. If you aren’t working with an agent, many times you can see pictures of houses that sold on Zillow.com or Realtor.com. Compare the fixtures and finishes to what you have in your house and adjust your price up or down based on what you find. Always be considering this from the buyers’ perspective. What would you think when you saw the houses that sold and then came and saw your house? It’s very important to be objective here. Sometimes we as homeowners are seeing things through a different lens. We need to get unbiased opinions from friends or family that are completely objective. For more great tips on pricing your house for sale, check out this article on Zillow. Not everybody is aware there are people who buy houses cash that will make you an offer to buy your house quickly. You might wonder,”why do they buy a lot of houses?” They buy for investment purposes and usually have the cash to close faster. This allows you to sell your house without even putting it on the market. What’s the catch with these house buying companies? They usually don’t pay full market value. That might be an issue if you need to sell for top dollar. Of course, this option doesn’t make sense for all home sellers. It makes the most sense for people that don’t have the time or energy to deal with getting their house fixed up and put on the market. This is also a good solution for sellers that don’t like the idea of having dozens of complete strangers going through their house, looking at all of their stuff. We buy homes in Memphis and would love to talk with you about what we can pay for your house. The quickest way to sell a house you put up for sale is to get as many eyes on it as possible. You need to make sure everybody knows the home is for sale. If you want to sell a house fast in Memphis, you might consider putting an ad in the local newspaper or their website. Real estate agents can list your house on the MLS (Multiple Listing Service) which will help you get maximum exposure. If you decide to sell your house without an agent, you can get a ‘For Sale By Owner’ sign from HomeDepot or Lowe’s and stick it in your front yard. I highly recommend you get the directional signs as well. This will allow you to point people driving around your area to your house that is for sale. Take lots of pictures and do a video walk through. You can post these on Facebook and Youtube. One social media platform is perfect for pictures: Instagram. Give it a try. Tell everybody you know that your house is for sale. Ask everybody you talk to if they know of anyone looking to buy a house in the area. You never know who might be looking for a house just like yours. This will certainly help you sell a house fast. There are lots of ways to entice buyers to give your house a little extra attention. Reward agents for finding you a buyer. We’ve given bonuses of $1,000 or more for buyers’ agents that sold their buyers on our houses. You can do the same. There are agents that look for listings of houses for sale where these bonuses are available and start showing their clients these houses first. Get yourself on the top of potential buyers’ must-see lists with this tip. When buyers see your house first, they may just fall in love with it and make you an offer. Offering an agent bonus has allowed us to sell a lot of houses faster over the years. Not all buyers need assistance with their closing costs…but most do! If you offer to help pay closing costs for your buyers, they will much more likely to buy your house over others on the market. In order to sell a house fast, you should consider offering this assistance. Be sure to write into the description of your listing your willingness to pay some closing cost assistance. It really goes a long way in persuading buyers to give your house more consideration. This tip for selling a house fast is not mentioned often. Providing a home warranty gives buyers a peace of mind. They might be nervous that they are overextending themselves when buying your house. They will likely feel better knowing that if something goes wrong, they have a warranty that will cover it. American Home Shield offers a great home warranty that is pretty comprehensive. It’s great because it doesn’t cost an arm and a leg either. We’ve offered their warranty dozens, if not hundreds of times. Offering a home warranty gives your home a competitive advantage that will allow you to sell your house quicker. If you want to shop around and find the perfect home warranty, check out these reviews. This piece of advice is one that I hope my competitors that sell houses don’t catch wind of. We make it a point to find economical ways of setting our houses apart so that they sell much faster. The secret is spending some time to see what houses are for sale that your home will be competing with. Then, make note of the similarities between the houses. Do they all have beige walls with white trim? Do they all have formica counters? Do they all have oak cabinets? Do they all have brown exterior paint? What you want to do now is find some things to do that will make your house stand out because it doesn’t just match all the others that are for sale. You sell a house fast by making it unforgettable. Great websites to get cheap design tips are Houzz.com and Pinterest. Whether you situation dictates you sell a house fast in Memphis or somewhere else, you can follow these 5 tips we’ve outlined to pretty much guarantee a quick sale. If you feel you’ve benefited from this article, please share it! 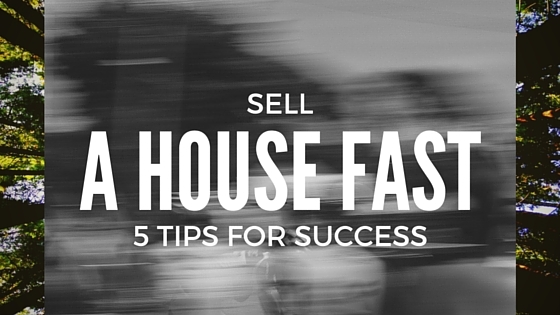 We’d love to hear any tips you might have for selling a house fast. If you have some tips, please don’t hesitate to leave them in the comments below.